On the evening of May 3rd, the Oregon State University College of Pharmacy alumni and friends gathered at the Portland City Grill to honor the recipients of the 2014 Icons of Pharmacy Award: Robert Beardsley, Gary Schnabel, and Jim Thompson. Robert (Bob) Beardsley grew up in Roseburg, OR where he developed an interest in the pharmacy profession at the encouragement of an influential high school teacher. 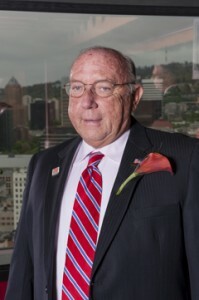 Bob attended Oregon State University College of Pharmacy, graduating in 1972. Even as a young student, Bob had an aptitude for leadership. During the days of the Black Panthers, Bob and others in the Blue Key Leadership Fraternity took a proactive role in arranging “teach-ins” instead of “walkouts”. He helped students understand the movements going on around them, preventing violence and property damage on OSU’s campus. Only seven pharmacy students nationwide received a U.S. Public Health Service Residency in 1972, and Bob was one of them. During his residency, Bob discovered a passion for education while teaching nurses in New Orleans. He and his wife, Kathy—a Speech Communications graduate, who he had met in the OSU Marching Band—then moved to Minnesota to pursue their PhD’s (Doctor of Philosophy) in higher education. In 1979 two positions became available at University of Maryland, and Bob and Kathy both continue to teach there today. After 16 years as Associate Dean for Student Affairs, Bob returned to teaching in 2005. He has also served as Vice-Chair for Education, and—currently—Vice-Chair for Administration. In addition to his teaching responsibilities at University of Maryland, Bob is actively involved with many committees and professional organizations throughout the nation. The best example of Bob’s impact on the pharmacy profession is his numerous contributions with the Accreditation Council for Pharmacy Education (ACPE). As International Commission Founding Member, Bob was a key player in the development and implementation of an international program to improve pharmacy education worldwide. He was appointed President of the Board of Directors for ACPE two years in a row, an uncommon occurrence. During his time as President, he was instrumental in making the accreditation process more transparent for colleges of pharmacy as well as continuing education providers. This change reflects a major accomplishment for pharmacy educational processes nationwide. Most recently, he is working to improve Pharmacy Technician programs and guidelines throughout the United States. Bob speaks highly of his wife, who is the Associate Dean of Behavioral and Social Sciences at University of Maryland. Together, they are a dynamic duo of higher education. Leading by example, they teach their students to be leaders in their professions. It is clear their passion and dedication reside in education and the success of their students. They have both received multiple awards throughout their careers including Mentor of the Year, Outstanding Teacher Award, Advisor of the Year and Robert Chalmer’s Distinguished Educator Award—a national award bestowed upon Bob in 2011. Bob and Kathy have one son who is an Associate Professor for the Department of Political Science at Emory University in Atlanta, GA and an associate faculty member at Duke University. Today, Bob enjoys teaching the children of previous students. He is most proud of the impact he has made in his students’ lives. Fellow colleague and good friend, Gary DeLander, presented Bob the Icon of Pharmacy Award. Gary is the Associate Executive Dean for the College of Pharmacy and is himself a born leader. He is involved with numerous state and national organizations including President-Elect of the Oregon State Pharmacy Association. Gary Schnabel grew up in Saint Helens, OR. In high school, he moved to Port Townsend and then began studying dentistry at University of Oregon in Eugene, graduating in ’72. He then went on to pursue a nursing degree at Lane Community College receiving his nursing license in 1975. When visiting his brother Joe, an OSU College of Pharmacy ’84 graduate, he convinced Gary to go to pharmacy school. Gary joined his brother at OSU College of Pharmacy and graduated with the Class of ’85. 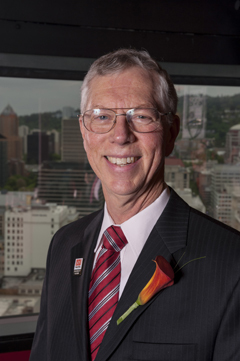 OSU College of Pharmacy is pleased to honor Gary as a true Icon of Pharmacy for his 16 years of leadership as the Oregon Board of Pharmacy Executive Director. During his tenure with the Oregon Board of Pharmacy, Gary’s focus was on instilling greater transparency in the processes of discipline and licensure in the state of Oregon. He managed many challenging issues through both legislative and regulatory processes. His leadership and the evolution of the board formed a more transparent interfacing with licensed professionals, other boards, Oregon’s legislature and the public it serves. Moreover, as President of the National Association of Boards of Pharmacy, Gary brought Oregon to the forefront as a national leader in the pharmacy profession. Gary’s nursing background not only helped him succeed in pharmacy school, but also provided him a broad perspective of healthcare. Even after becoming a pharmacist, he continued to maintain his nursing license in order to successfully collaborate with other healthcare providers and groups in both the clinical and regulatory aspects. Gary’s most proud moment came when he was invited to Washington D.C. in 2005 to testify before the Senate Special Committee on Aging about Oregon’s experience with drug access via the Internet. The honor of testifying in front of the Senate Committee provided him with both personal and professional growth. Gary and his wife, Tammy, have been married for 22 years. Enjoying Gary’s retirement from the Oregon Board of Pharmacy, they recently moved into a new home near the Ilahee Hills golf course in Salem, OR. The couple spends their free-time learning to play golf and with their friends and family. Tammy is a registered nurse, currently working in administration. Close friend and College of Pharmacy ’83 graduate, Cathy Lew, presented Gary with his Icon of Pharmacy award. Cathy started her career in pharmacy at Sacred Heart Medical Center and over the years has worked in hospital, community, university, and ambulatory care settings. Cathy and Gary have been friends and colleagues for many years, having worked together at Home Care in Eugene, on the Board of Pharmacy, and at the National Association of Boards of Pharmacy. Jim Thompson was born and raised in Oregon. He graduated from Taft High School and went on to study at both Western Oregon University and Oregon State University. Jim received a Medical Botany Degree from OSU and enjoyed working with pollen and asthma. This interest lead to a career at Bayer Pharmaceuticals helping to develop technologies using agricultural products to treat asthma and allergies. Healthcare is at the forefront of Jim’s urgencies. He strongly believes in the need for healthcare reform. He sees a need for improvements to pharmacy in the areas of medication delivery, medication therapy management, and long-term care. 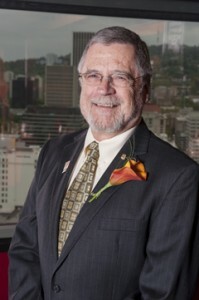 He serves on the Oregon Health Care Volunteer Advisory Committee, Health Safety Net Advisory Committee, and the Public Health Logistics Workgroup. Furthermore, Jim has served as Executive Director of the Oregon Pharmacy Association where he oversaw continuing pharmacy education programs and worked to strengthen drug safety regulations. After 26 years with Bayer Pharmaceuticals, the company sold the department Jim worked for. He had the option to take an early retirement or move to Cincinnati, OH. The lifelong Oregonian he is, he chose early retirement and began working as a consultant. Jim had served on the Monmouth City Council in the 1980’s and when Representative Lane Shetterly resigned, a friend called Jim and convinced him his background and education made him a qualified candidate for the position. In 2004, Jim was appointed state Representative by the county commissioner. Jim and his wife of 46 years, Helga, live in rural Oregon and greatly enjoy the outdoors. They have a forested yard and spend much of their time landscaping. They have two children and four grandchildren who they enjoy spending as much time with as possible. OSU College of Pharmacy Class of ’84 alumnus and 2012 Icon, Larry Cartier, joined us for the event to introduce Jim and present him with the award. Larry is currently the Chief Pharmacist and Director of Pharmacy Services for ZoomCare. He has been a leader in the pharmacy profession for decades and has devoted considerable energy to working in Salem and around the state to engage the profession in important issues and discussions.